I love mangoes and I love this mango milkshake Recipe. mango milkshake is a quick and easy recipe. Mango milkshake is a very satisfying cool drink in the hot summer afternoon. It can be served as a snack or along with or after dinner. It is a filling, nutritious drink. Mango is the king of fruits in India. Many mango varieties are available during the summer months. 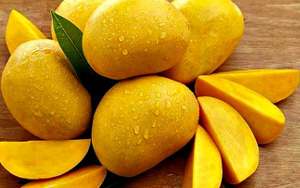 Mangoes are available starting from the month of March or April, to the month of August. Using pulpy, sweet mangoes enhances the taste of any mango recipe. You may use Alphanso, Raspuri etc. for making this mango milkshake. Avoid using mango variety where you find lot of threads. Whenever I have some excess ripe mangoes, I use them to make this mango milkshake. A slightly over ripe mangoes also may be used. Mangos are eaten by themselves or many deserts and sweets are made with ripe mango such as mango ice cream, mango burfi etc. This mango milkshake recipe is one such ripe mango recipe. You may use fresh or frozen mangoes for this milkshake. There is no artificial flavor or color added to this. The mango you choose give it a natural flavor and color. So choose your mango with care. Select only ripe and sweet mango. You may use plain milk or homemade or store bought vanilla flavored milk to make this mango milkshake. Sugar or honey - 1tbsp, more or less according to taste. Wash mangoes and wipe with a clean cloth. 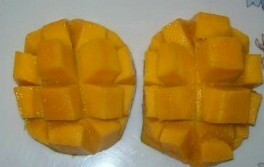 Cut mango sides into a slice as shown in the image. Cut the pulp into squares. Cut the squares into a bowl or a plate. 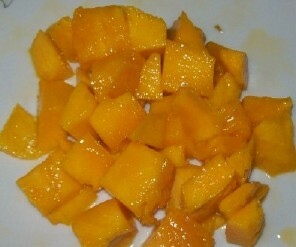 In the image, you can see ripe mango pieces from two mango side slices. Put the mango pieces, sugar(if using), 1/2 cup milk in the blender. Blend till it becomes smooth. Add remaining milk. Blend again till frothy. Add ice cubes and blend some more. Fill tall glasses with milkshake. Add a few slices of mango on the top and sprinkle with cardamom powder and serve chilled. To make mango milkshake choose ripe, sweet mangoes. That way you will not need to add any sugar or may need to add only a little sugar. I usually do not add any sugar. You may use store bought or homemade mango pulp or preserved mangoes to make this milkshake. 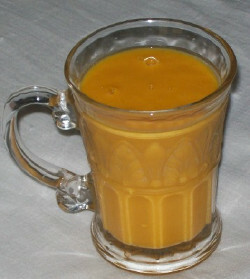 Sugar quantity will depend on the sweetness of mango, freshness and sweetness of the flavored milk if you are adding it. And also on your sweet tooth. Add more milk if you like slightly thinner milkshake. Add a pinch of cinnamon powder while blending if you like the flavor. Top with vanilla or mango ice cream or a few pieces of mango. Instead of sugar, you may add any other sweetener such as bee's honey, date syrup, maple syrup etc. according to taste.